Jennie Bess Bigham Russo, daughter of Nathaniel Bushrod Bigham and Lucy Ethel Young, married to Frank J. Russo and buried in Buffalo Gap Cemetery, Buffalo Gap, Taylor County, Texas. 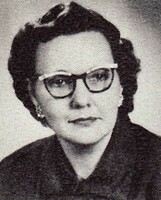 South Taylor County Independent School District Grade School Teacher (1955-1957). First Jim Ned Consolidated Independent School District High School Biology and Science Teacher (1957-1975). BUFFALO GAP – Jennie Bess Russo, 88, died Sunday, February 15, 2004, in an Abilene nursing center. Funeral mass will be 2:00 p.m. Wednesday at Holy Family Catholic Church, 5410 Buffalo Gap Road in Abilene, with Msgr. Fred Nawarskas officiating. Burial will be in Buffalo Gap Cemetery, directed by Fry-Bartlett Funeral Home in Tuscola. Visitation will be Tuesday from 7:30 to 8:30 p.m. at the funeral home. Mrs. Russo was born in Stamford December 25, 1915, to Nathaniel Bushrod and Lucy Ethel Young Bigham. She moved to Abilene in 1923 and graduated from Abilene High School in 1932. She received a B.A. degree in 1935 and an M.E. degree in 1958, both from McMurry University. She taught school for 29 years, including 26 years in Jim Ned CISD, retiring in 1975. She married Frank J. Russo June 4, 1944, in St. Louis, Missouri. He preceded her in death in 1974. Mrs. Russo was a volunteer Red Cross worker at Dyess Air Force Base pharmacy for 11 years and was active in Buffalo Gap Old Settlers Association and Buffalo Gap Cemetery Association. Memberships included Abilene Retired Teachers Association, Retired Teachers Association of Texas, Tom Green Chapter of the United Daughters of the Confederacy (UDC), John Davis Chapter of the Daughters of the American Revolution (DAR), and Holy Family Catholic Church. Survivors include two daughters and sons-in-law, Jacque and J. D. Dennis of Buffalo Gap and Barbara and Alton Gardner of Oklahoma City; a grandson, Jerry Alford Dennis, Jr. and wife Michelle of Buffalo Gap; and several nieces, nephews, and cousins. Memorials may be made to Hendrick Hospice Care, P. O. Box 1922, Abilene, TX 79604 or West Texas Rehabilitation Center, 4601 Hartford, Abilene, TX 79605. Mrs. Russo was my all time favorite science teacher. I was always interested in what she taught in middle school in Lawn. She was really sweet to all the kids and fun! She was our own "Mr. Wizard".